During the slice of life challenge, I wrote a bucket list of things I want to do in Korea before I leave. Elsie suggested that I could write a slice about the things that I cross off. We took one of our friends as part of her early birthday present. We didn’t tell her where we were going. All we said was, we are going to be taking pictures! We took her on the subway and finally arrive to Myeong Dong. First, we took her dress shopping (for her birthday dinner outfit). Then, we started walking to the cafe. As we walked past stores and different streets, she tried to guess where we were taking her. She we knew she would never guess where. Then, we got lost. I was trying to follow the directions I printed out on the Internet that weren’t very specific. I ended up calling the cafe and they gave me easy directions. Afer that, we found it very quickly. Our friend was very surprised and excited! 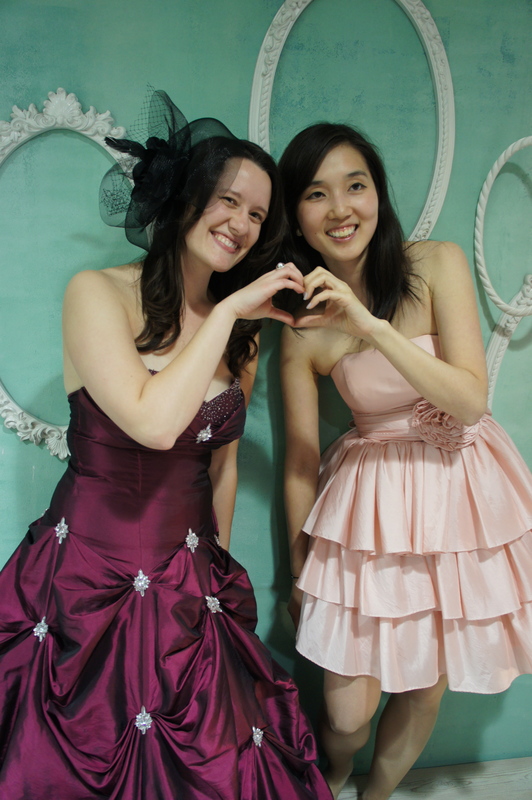 Only in Korea can you rent dresses and take pictures in a cafe. 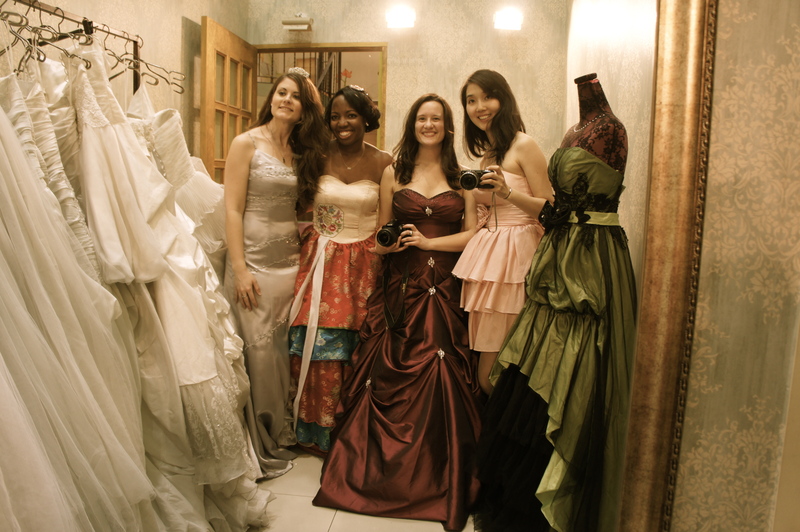 We definitely had a fun time choosing dresses, dressing up and taking photos, Korean style! 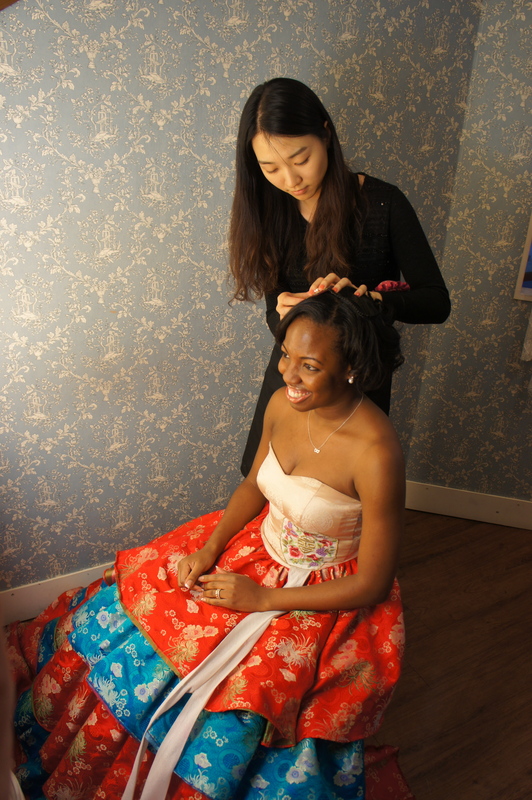 They had traditional Hanboks (Korean dress), party dresses and even wedding dresses. 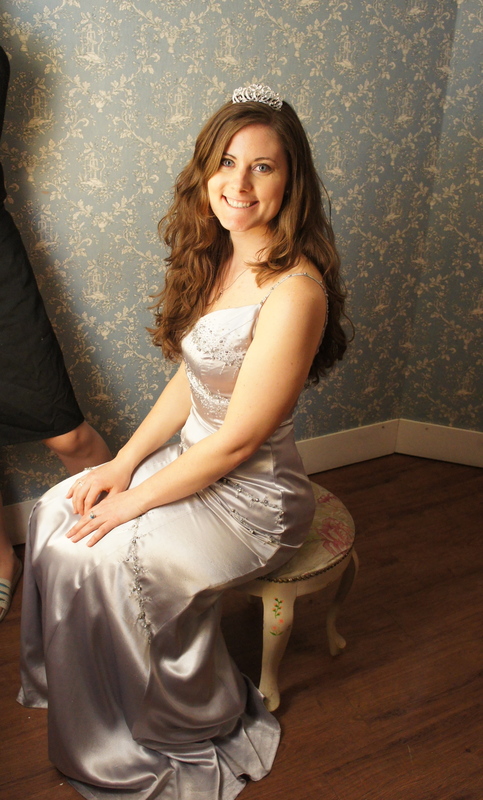 You do have to buy one drink per person from the cafe and you have to pay to rent a dress. 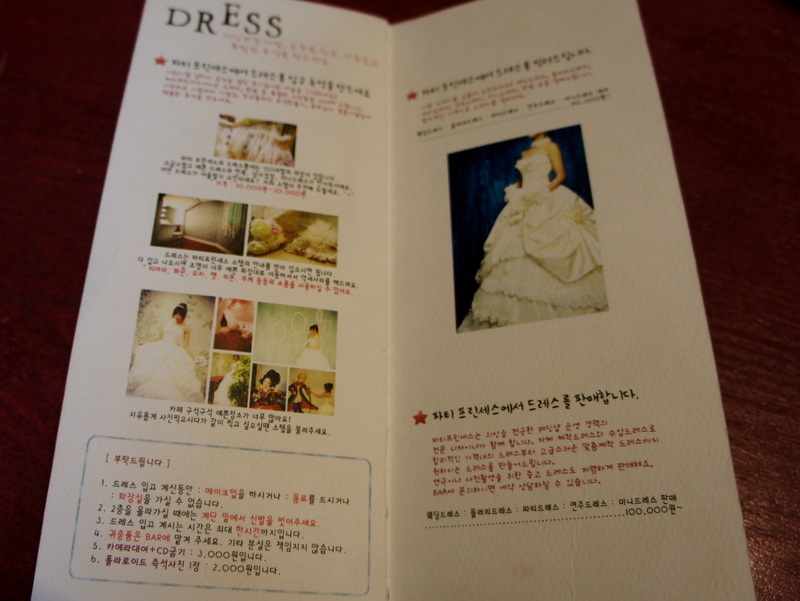 The dresses cost from 10,000-40,000KRW (about $10-40). There are actually tuxes/suits that guys can rent as well. 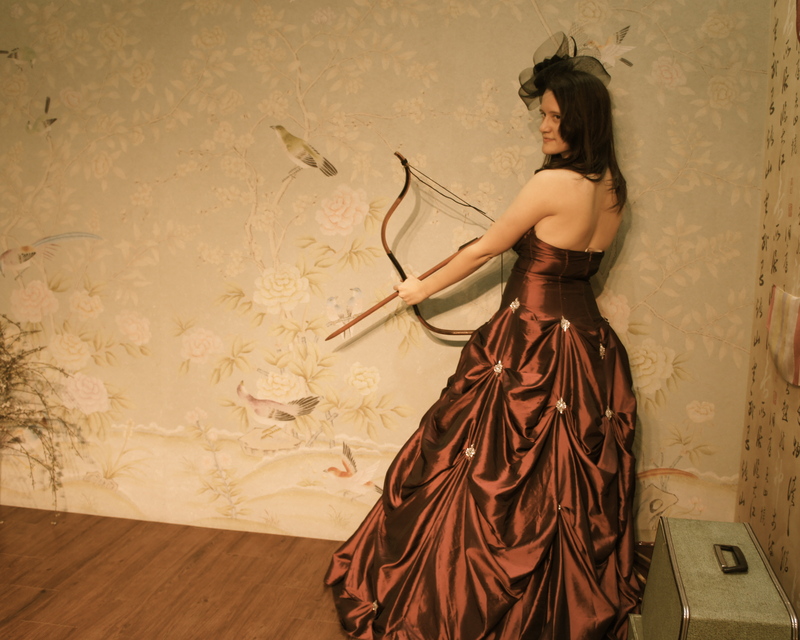 You have about an hour to take the photos in the different rooms. Take Line 2, get off Eulchiro 1-ga, exit 6. Walk straight (1-2 minutes), pass the KB bank, until you see an IBIS hotel on the left. 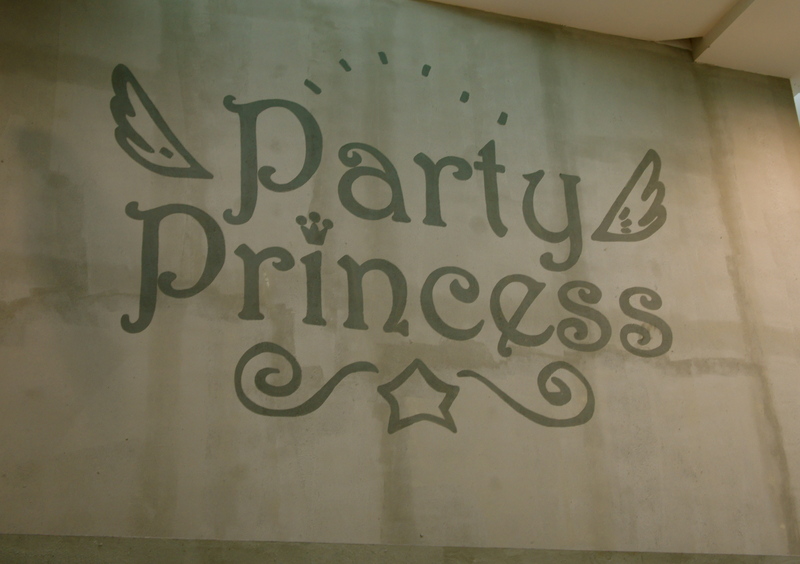 Go inside, and on the second floor you’ll find the party princess cafe, across from other restaurants. 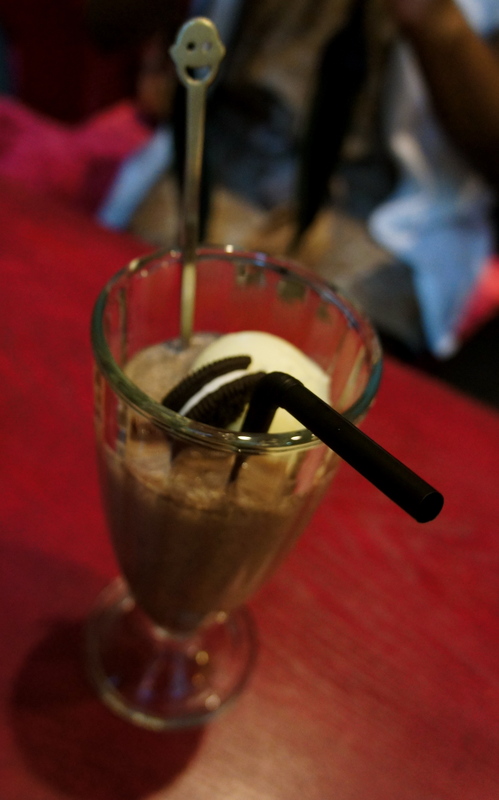 Or you can get off Myeong Dong station and walk through the main street, towards the big H&M and CGV, and make a right onto the Krispy Kreme alley. 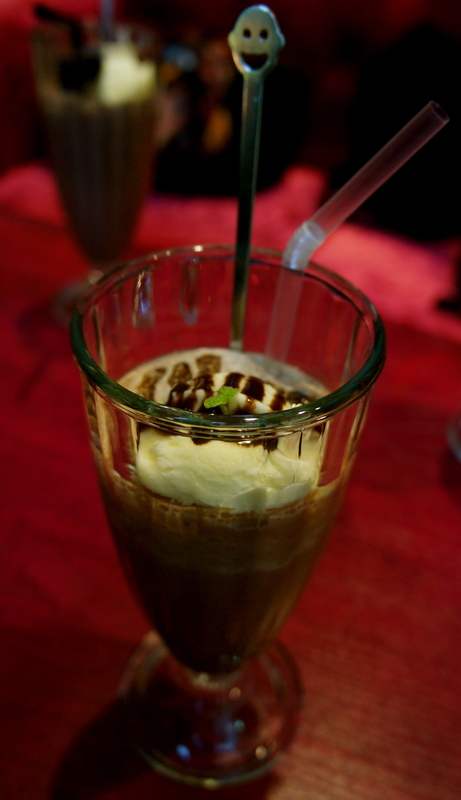 From there, walk straight a few minutes and you’ll see an entrance to the cafe, in the IBIS hotel building. 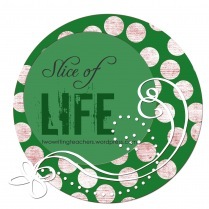 The slice of life challenge is hosted every Tuesday by Two Writing Teachers. That sounds like so much fun. What an idea. You all look so lovely!! Thanks for sharing your unique adventure. What a fun thing to do – glad you shared your good times with us! Why don’t we have a place like that here? Maybe Starbucks could start that! After spending Saturday in Phialdelphia with my friends, this topic was of high intererest. I can so relate with following direction that are not quite clear from the net! That’s the way to celebrate a birthday! Sounds like you had fun, even the getting lost. Thanks for sharing this adventure. Looking forward to more stories. How fun! I think some business man/woman should start something like that up here-it sorta reminds me of prom! very nice pictures you shared! What a lovely surprise for your friend, Jee, & your pictures are so delightful. 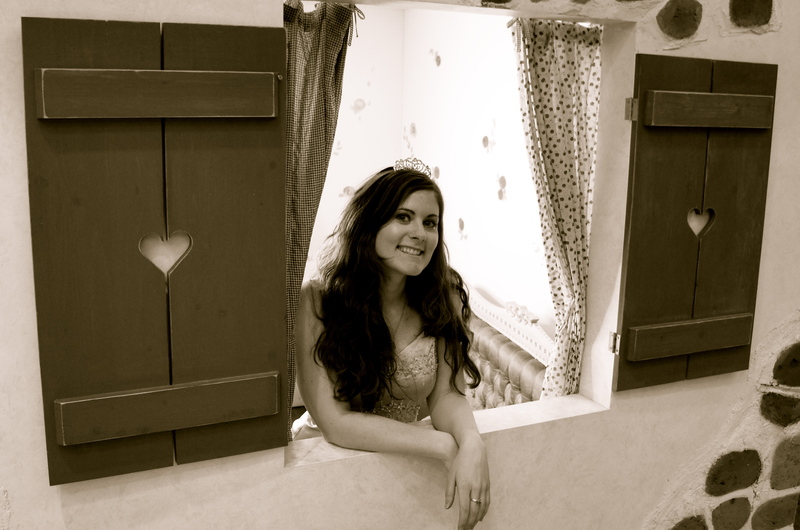 Thanks for telling about this & sharing the pics of the dresses, beautiful like those wearing them! This is so cool. I would have chosen something exotic like the multi-colored outfit. You know how to celebrate. Glad you sent many pictures! Oh my goodness, I want to go there! Looks like so much fun. Do they have a photographer for the photo taking session? No they don’t, so you need to bring your own camera to take photos! Not so sure if they do. Basically they have the dresses there, and they pin up the back so it can fit a variety of sizes, but again it is Korea and larger sizes are harder to come across. Sorry, this answer is not too helpful! You may have to call beforehand. I need this in my life! Thanks for the review!! !